The club was born in 1965, but was conceived long before then in the Crofton Hotel (where the BIM offices now stand). It was there that a number of owners who were not members of any club and who kept their boats haphazardly in the Inner Harbour or in the Coal Harbour used to meet. It was at the suggestion of Joe Briscoe, our founder commodore, that the formation of a proper club was considered and with a subscription of £1 each he raised a fund of £30. With this and the help of a dedicated band the task was tackled. Meetings with official bodies, plans and more plans, articles of association, planning permissions – horrendous problems were tackled and solved. The then harbour master, Commander Thompson suggested the present site while members gave their services free of charge. Amongst there were architect Brian Doran, heating engineer Cecil Buggy, civil engineer Jim Hegarty and many, many others who donated their skills. Big money was then needed so, to supplement grants and loans, a water carnival was run which attracted 25,000 people to Dun Laoghaire and yielded £2,000 – undreamed of success. It was repeated the following year. The club was finally built and has since undergone a number of modifications including the building of the slip and the dinghy park. We owe a great debt of gratitutude to our founder members whose names are honourably inscribed on a board over the stairway. The Club was named to indicate that it catered for all types of craft and for all types of people - the only common denominator being that they get their enjoyment from boating. 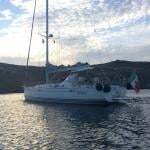 So if your leisure pleasure is serious sailing or just ‘messing about in boats’ and if you are looking for friendly companionship which will last a lifetime - welcome aboard! Founded in 1950, the club currently has over three hundred members, racing in several classes including cruisers, Wayfarers, 420s, Lasers, Toppers and Mirrors. Racing for cruisers during the summer season is every Wednesday and Sunday, while racing for dinghies is held every Saturday afternoon. Our cruising sailors usually head to Porthmadog in July and we often take in other trips along the Irish coast. We provide Junior Training during the month of July and/or August for ten years old and up. Wicklow Sailing Club is an ISA accredited training centre for junior training levels 1 to 5 and also powerboat training. Our sailing visitors are always welcome to use the Clubhouse and it’s facilities. We have a very friendly reputation on Ireland’s East Coast and love to hear tales of sailing derring do. The bar is open every night in the summer (Jun/Jul/Aug) and Thursday to Sunday in the winter. Adequate berthing is available on the quayside (East pier) or only by prior arrangement on swing moorings. Wicklow is a busy commercial port, with often one or more large ships berthed in the river and an active whelk fishing fleet, so berthing space can be a problem. Our clubhouse is located on the South Quay of Wicklow harbour, adjacent to the RNLI station. 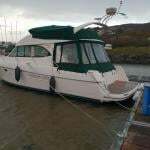 We are twinned with Madoc Yacht Club, our Welsh neighbours in Porthmadog, North Wales. Now our Town Councils are also twinned which was formalised in September 2006. In the year of 1950, a small band of enthusiasts under the guiding arm of the late Joseph T. O'Byrne (fondly remembered by all as J.T. ), gathered in the Bridge Hotel (birthplace of Capt. Robert Halpin, master of the ‘Great Eastern’ steamship that laid the first TransAtlantic cable in the late 1860s) to put the wheels in motion to start a new club in Wicklow, dedicated to Yachting, and in 1951, Wicklow Sailing Club was born. The first boats acquired for the fledgling Club had an interesting history. The boat decided on by the new members was the Cadet, a 12’ wooden dinghy, and the first five of these came to the Club from an unlikely source. A former Army Captain, who had killed his wife’s lover in a fit of jealous rage, was detained in Dundrum Lunatic Asylum for the Criminally Insane, and was contracted by those founding members to build a number of these boats. Along with the unfortunate Captain’s consignment (collected from Dundrum by Harry Jordan, a founding member, former Commodore and WSC’s only continuous member over the 50 years), some club members also built a number of other dinghies, like the Kearney brothers GP14, and a racing fleet was born. The next major step was the requirement for a club/store house and through the efforts of these new members running hops, dances and other fundraising events, sufficient funds were raised to secure a site on the South Quay adjacent to the RNLI station. The first sod was turned in 1953, and a basic building erected. Through several subsequent transformations, this humble shed has now become the fine modern comfortable Clubhouse and Bar that exists today for our members to enjoy. In the 50s, the Club expanded rapidly and more dinghies were required to keep pace with the demand. They acquired Herons, IDRA 14s, and the members through another cooperative effort built several Graduate dinghies, one of which still survives today in the ownership of Stan Kiddle, our former Honorary Subscriptions Secretary. It was this spirit of all hands on deck that has surely laid the solid foundation that has made Wicklow Sailing Club the vital force that it has now become in Irish sailing. During the 60s and 70s, mini fleets of 420s and Mirrors regularly graced the waters off Wicklow Bay, a learning ground for many sailors who are now well known all around our coasts. Over the intervening years, many regional and national dinghy events have been successfully run from the slipway in front of the Clubhouse and in the early 70s, J.T. oversaw the building of the boatpark, adjacent to the slip. This Boatpark was upgraded in 2006 with the laying of a concrete floor and is now a wonderful facility for our mainly junior dinghy fleet. Eventually a number of cruisers augmented J.T.’s ubiquitous ‘Wamba’ to add a new dimension to the sailing options available. Boats such as the wooden Polish folkboat bought by Peter Gale, called ‘En-route’, and subsequently his ‘Felice’ on which he was to die in the Isle of Man. Wicklow had had a long history of Cruiser racing going back into the previous century, when the British custodians of the day would run regattas (in conjunction with the Town Regatta Festival, which is Ireland’s oldest continuously-run festival) for their military and noble folk and some of their grand trophies have survived to the present day. In more modern times, several regattas and rallies using Wicklow as their hub, attracted sailors from up and down our coast as well as from across the pond in Wales and England. The early 70s had firmly established Wicklow as a fun place to go for a Bank Holiday weekend of good sailing and craic. In 1979, a Round Ireland Rally was proposed (with a number of stopovers enroute) and due to its success, a more ambitious idea was born. A race, starting from and finishing in Wicklow, leaving Ireland and all its islands to starboard was proposed, and under the stewardship of the late Michael Jones, the 1980 Round Ireland was born. Subsequently, under the sponsorship of Cork Dry Gin, this supreme offshore test of boat and man has become a major International event on the biennial sailing calendar. BMW came on board as title sponsors in 2004 and the race continues to grow in stature. The current co-ordinator, Dennis Noonan, is very encouraged by the positive feedback received, both from sailors at home and abroad. 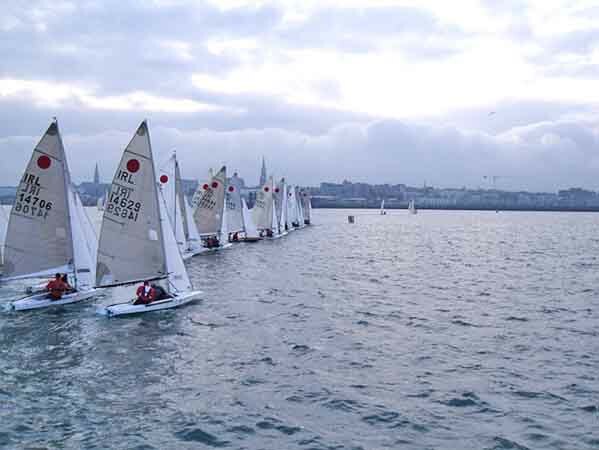 This event is obviously the jewel in the crown of Wicklow Sailing Club and despite the onerous demands it puts on the shoulders of all the members every two years, it will continue to be hosted from Wicklow harbour for the foreseeable future. During 2008, WSC hosted two major dinghy events (incl. Fireball Nationals) as well as the BMW Round Ireland. Wicklow Sailing Club is proud of its role in bringing many visitors to Wicklow harbour throughout the sailing season, who add colour and variety with their boats and also contribute in no small way to the tourism spend within the local community. This has been greatly enhanced by our very strong relationship with several Clubs and individuals across the Irish Sea, to the extent that we are formally twinned with Madoc Yacht Club, who are based in the beautiful town of Portmadoc, which nestles under an impressive backdrop of Snowdonia and we are particularly chuffed that this connection was instrumental in the official twinning of the respective Town Councils in 2006. Our founding members (of whom a few still survive) would be proud to see the thriving Club that exists today, 50 years later, and now that a new Millenium has dawned, the mantle has passed to the current membership to take the next brave steps to further improve and enlarge both our facilities and numbers. One member, Harry Jordan, has continued this connection unbroken right down to the present day, even though he spends most the year in Bundoran, Co Donegal nowadays. Unfortunately, space is now at a serious premium both on our moorings and in the Boatpark, with the result that we are unable to promote space for new boatowning members. Perhaps the initiatives of bodies like the Irish Marine Federation, who represent Leisure boating interests against a Government that continues to ignore Ireland’s potential maritime goldmine, will bear fruit as there seems to be a severe lack of will in the public sector to improve Wicklow’s long overdue upgrade to a marina destination. Wicklow Sailing Club will open its doors to all who wish to sail, provide a safe and friendly environment in which to participate in the sport, advance plans to improve Clubhouse and waterside facilities and continue to contribute to the sporting and social life of Wicklow and its environs. The Inland Waterways Association of Ireland is a voluntary body formed in 1954 of inland waterways enthusiasts. For all the latest Inland Waterways news click here. We advocate the use, maintenance, protection, restoration and improvement of the inland waterways of Ireland. The association was founded in 1954 to campaign for the conservation and development of the waterways and in particular their preservation as working navigations. When the Shannon was almost totally undeveloped for pleasure boating, IWAI fought the building of low bridges, thus ensuring the development of the river as an asset for all to use and enjoy. In the 1960s IWAI successfully fought plans to close the Circular Line of the Grand Canal in Dublin. Later the association campaigned for the re-opening of the Ballinamore & Ballyconnell Canal (now the Shannon-Erne Waterway) and the Naas line of the Grand Canal. IWAI is the voice of waterways users and enthusiasts. It represents the views of members to governments (Northern Ireland and the Republic of Ireland), to Waterways Ireland and other navigation authorities, to local authorities and the range of statutory and state-sponsored bodies whose activities impinge on the waterways in one way or another. IWAI has approximately 4,400 members mainly organised in branches associated with the major navigations across the island. Our membership is drawn from all walks of life and from people with a wide range of interests-boating, angling, walking, heritage, environment. Many of our members own and use boats on our rivers, lakes and canals ranging from motor cruisers to jet-skis, from barges to sailing dinghies and RIBs to rowing boats. The association is a company limited by guarantee and a registered charity (CHY no 10915). It is governed by a council made up of representatives of each of the local branches and directly elected officers and members. Day to day affairs are managed by an executive committee. A number of Committees are active within IWAI including the Heritage & Conservation Committee, Boating & Leisure Committee, etc. Publications: The IWAI publishes ‘Inland Waterways News’, a quarterly magazine, sent out free to all members. The magazine covers a wide range of topics of interest to waterways enthusiasts at local, national and international level. IWAI also publishes a number of waterways related books and guides. Our web-site is one of the largest single reference sources for waterways related material in Ireland and a major source of referrals for waterways related businesses which brings local events, activities and developments into national perspective. Some of the branches bring out local newsletters. Our web site at www.iwai.ie is packed with waterways-related information. Whether a boat enthusiast, historian, archaeologist, or fisherman, you will find something here of interest. South: Athlone, Barrow, Belturbet, Boyle River, Boyne Navigation, Carrick-on-Shannon, Corrib, Dublin, Kildare, Lough Derg, North Barrow, Offaly, Shannon Harbour, and Slaney. Improvements and Restoration: Work parties and funds are raised to improve navigations and to restore derelict ones. Current projects include the Ulster Canal, Lagan Navigation, Coalisland Canal, Boyne Navigation and the Kilbeggan and Corbally lines of the Grand Canal. A synopsis of current activities is found here. The photo at right shows a work-party working on the Boyne navigation. Boat rallies: IWAI organises rallies and other events including annual rallies on the Barrow (Easter), Dublin (May), the Erne (May), the Grand Canal (June), Shannon Harbour (June), the Corrib (July), the Shannon (July), Lough Derg (July). Competitions help to raise standards of boatmanship, seaworthiness and safety afloat. Member Services: The IWAI Shop IWAI provides a number of branded products and services for members. The association burgee and ensign are shown at right. We also sell waterways-related books and navigation charts. Email Discussion Forum: We host a very active discussion forum. Here, you will meet folk who enjoy talking about life on our waterways. Generally, people are very free with advice on the list (whether wanted or not) and can point you in the right direction if you have problems finding a 3/4 inch flux capacitor for your 1984 vintage submarine. The forum operates a parallel web-based and email service. Navigation and related announcements: If you would like to keep up to speed with announcements, news, and press releases from the IWAI, you can subscribe to the association’s News Updates List. (a) To promote the use, maintenance and development of the inland waterways of Ireland, and in particular, to advocate and promote the restoration to good order, and maintenance in good order of every navigable waterway and the fullest use of every navigable waterway by both commercial and pleasure traffic, provided such is not injurious to the environmental health of the waterways and surrounding areas. (b) To support any proposal which may be calculated to maintain or improve Irish waterways and also to improve navigation, lay moorings and carry out other works of improvement on and adjacent to the waterways. (a) To oppose by appropriate action the abandonment or neglect of Irish canals or river navigations, the pollution of waterways, the obstructions of navigations by fixed bridges, aqueducts, overhead cables, or otherwise, the obstruction of towing paths, or any other action calculated to injure or destroy the navigation or amenities of the waterways of Ireland. (b) To prepare, either alone or in collaboration with any other body, guide books, charts, maps and other literature suitable for use by persons using the Irish navigations for any purpose, and to foster public interest in and knowledge of the Irish waterways by disseminating information on the subject to members and to the general public. (c) To organise visits to objects and places of interest on the waterways including water-borne journeys. (d) To do all such acts as shall further the active and corporate life of the Association and to cooperate with any other body having similar or sympathetic aims. (e) To represent the interests of boat owners in all matters pertaining to the above objects. (f) To organise, engage in, and sponsor boat rallies, exhibitions, displays, festivals, carnivals, sports, hobbies and entertainments. Details of IWAI Policies can be found here.